Terra is a multi-national, multi-disciplinary satellite mission involving partnerships with the aerospace agencies of Canada and Japan. Managed by NASAÛªs Goddard Space Flight Center, the mission also receives key contributions from the Jet Propulsion Laboratory and Langley Research Center. The Terra spacecraft houses five major instruments; three of these – ASTER, MODIS and MISR – have been actively supporting the process of visualizing the disaster in Japan. Together with commercial and international satellite images, Terra instruments are measuring and visualizing earthquake and tsunami damage, and may even provide visualization of heat created by the damaged Fukushima Daiichi nuclear reactors. 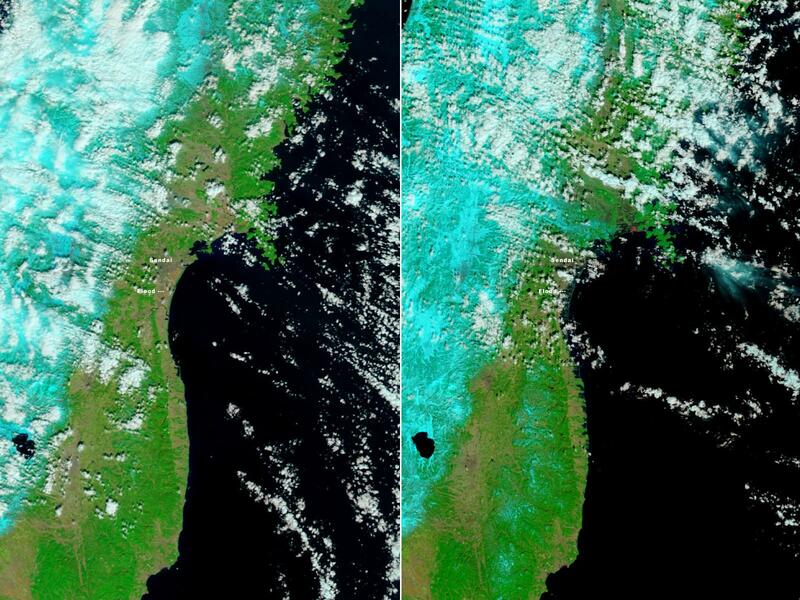 These ASTER images compare a March 14, 2011 image of the northeastern Japan coastal cities of Ofunato and Kesennuma, about 90 kilometers (55 miles) northeast of Sendai with a similar image taken in August, 2008. Areas covered by vegetation are shown in red, while cities and unvegetated areas are shown in shades of blue-gray. When compared closely, it can be seen that vegetation is no longer present in many coastal areas in the new image, particularly around Kesennuma, a city of about 73,000. ASTER images courtesy of NASA, Goddard Space Flight Center (GSFC), JapanÛªs Ministry of Economy Trade and Industry (METI), Earth Remote Sensing Data Analysis Center (ERSDAC), Japan Resource Observation System (JAROS), U.S./Japan ASTER Science Team, and the Land Processes Distributed Active Archive Center (LP DAAC). The Advanced Spaceborne Thermal Emission and Reflection Radiometer (ASTER) obtains high-resolution (15 to 90 square meters per pixel) images of the Earth in 14 different wavelengths of the electromagnetic spectrum, ranging from visible to thermal infrared light. ASTER data provide researchers with the tools to create detailed maps of land surface temperature, emissivity, reflectance, and elevation. ASTER is the only Terra instrument capable of being directed to a specific location, and while its imaging systems cover a swath of only 60 kilometers, its high resolution provides visualization of objects as small as an individual house. In the aftermath of the massive earthquake and its subsequent tsunami, several oil refineries and industrial complexes caught fire, including facilities in the Port of Sendai and a petrochemical facility in Shiogama, where a large explosion had been reported. This pair of images, acquired on March 12, 2011 by the Multi-angle Imaging SpectroRadiometer (MISR) instrument aboard NASA's Terra spacecraft, shows a large smoke plume that appears to be associated either with the Shiogama incident or the Sendai port fires. At left is a natural color view, where the smoke appears as a brown-colored plume. At right is a stereoscopic ÛÏanaglyphÛ created from data at two different view angles; the observed displacements show that the plume is an elevated, airborne feature. The Multi-angle Imaging Spectroradiometer (MISR) views the sunlit Earth simultaneously at nine widely spaced angles, providing ongoing global coverage with accurate measures of brightness, contrast, and color of reflected sunlight. Of particular importance for the Japan event, MISR’s multiple camera angles provide stereoscopic images, allowing viewers to distinguish and measure the height of plumes of smoke and aerosols. The Moderate Resolution Imaging Spectroradiometer (MODIS) acquired the right image of the Sendai region on March 12, 2011, at 10:30 a.m. The left image, taken by Terra MODIS on February 26, 2011, is provided as a point of reference. One Moderate Resolution Imaging Spectroradiometer (MODIS) is housed on the Terra satellite, and an identical instrument is housed aboard the Aqua platform. Terra’s orbit around the Earth is timed so that it passes from north to south across the equator in the morning, while Aqua passes south to north over the equator in the afternoon. Terra MODIS and Aqua MODIS view the entire Earth’s surface every 1 to 2 days, acquiring data in 36 spectral bands. Together, the three Terra-based instruments create a full, multi-layered, time-sensitive picture of the Japanese situation. MODIS provides daily imaging of inundated areas and plumes with relatively low resolution. By using daily images from MODIS, researchers can appropriately identify areas for additional study with MISR’s nine-camera stereoscopic and multiangular capabilities. MODIS also provides views of the entire coastline, while ASTER focuses in with higher resolution on the more critical areas. Terra images also are the source of derived products that provide additional information. Satellite data can, for example, provide pre and post-event imagery that supports the development of flood maps or maps showing the progress of aerosols from fires. Global Differential GPS was tested during the 2010 Chilean earthquake and tsunami. This study demonstrated for the first time that real-time GPS data could be successfully used to estimate the size of the Chile tsunami, as confirmed by satellite altimetry data after the event. A prototype tsunami prediction system is in development for the Pacific Tsunami Warning Center in Hawaii; it is expected that the system could provide populations with extremely timely information about earthquakes and potential tsunamis. In the long run, such a system could save many lives. In the future, Song and his colleagues believe a combination of satellite and ground sensing will be the key to detecting tsunami formation early enough for advanced warnings and give people more time to move to higher ground. In addition, Terra images provide information about the coastal topography, which can be used to improve inundation maps for effective evacuation. With GPS and related land surface instruments and ocean buoys, researchers also will have the tools in hand to predict when and where a tsunami will strike – and how significant the wave will be when it arrives.